Tom Lawton, AIA is known for using common sense and for tapping all of his senses to use in his work. He combines his diverse design and life experience to create nourishing, well-proportioned spaces filled with natural light, grounded in the natural environment. Known for his keen sense of humor, clients say working with Tom is fun and productive. Most of his clients become friends, and he maintains frequent social contact with them. In fact, at his recent 40th birthday bash at least three quarters of the attendees were former clients. Tom has more than 20 years of expertise in architecture, initially working for Southern architectural firms. He opened his own practice in Black Mountain, North Carolina in 2001. As the principal, he works on each phase of each design for his clients, using a clearly defined process that allows work to flow smoothly. He has all the credentials you expect from a professional— member of AIA, NCARB certified, LEED accredited, and NC licensed architect. His education includes Bachelor of Architecture and Masters of Architecture degrees from Savannah College of Art and Design. His LEED accreditation reflects a strong commitment to sustainable architecture, and his familiarity with building LEED certified homes is appreciated by his clients. This educational background supports his desire to protect the environment by lowering energy consumption and working with the natural aspects of the site. Tom loves architecture almost as much as he loves spending time with his family. He also enjoys sailing, biking, and golfing. 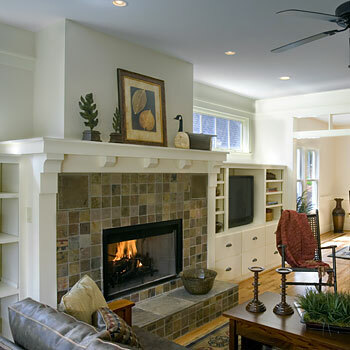 Although he specializes in new home design, Tom also works on renovations and additions to existing homes. He has additional expertise in other design disciplines, including furniture, product design, and cabinetry, and has designed a performing arts center, medical facilities and offices, a recording studio, and restaurants. This breadth of experience gives him a fresh perspective on each project. Copyright © 2007-2014, Thomas Lawton Architect. All rights reserved. 'LEED Accredited Professional' and the related acronym, and the Legacy LEED AP logo are trademarks owned by the U.S. Green Building Council and are awarded to individuals under license by the Green Building Certification Institute.